Wet Paint has two definite camps of customers, one of learners and one of teachers. There is a regular quest for classes and demos from those who hunger for more knowledge. I believe it is the nature of many artists to be on a continuous path of learning. At the same time there are artists who are so enthusiastic and passionate about their art that they cannot contain themselves from sharing their knowledge and experience. I believe for many, being a teacher is synonymous with being an artist. Wet Paint is a perfect place to introduce these two camps to each other and we are actively experimenting with different formats where these creative individuals intersect. We are fortunate to bring Ioana Stoian to Wet Paint for two origami workshops. Ioana’s passion is paper and folding. A professional and an active member of the International Association of Hand Papermakers and Paper artists, Stoian has written a book, Origami for All, Elegant Designs from Simple Folds, which contains her own original origami designs. Each workshop has unique seasonal designs which you will learn from a master yet requires no previous experience. We are trying out some new time slots on these classes, one on Tuesday evening, March 25th and one on Wednesday morning on April 16th. Joyce Francis needs no introduction. A master calligrapher in search of new artistic outlets, Joyce found the art of contemplative patterning, Zentangle, to be her new passion. We have had other Zentangle workshops with Joyce and the participants always ask for more. We have two sessions of the same class coming up on Saturday, March 22. No experience required. These classes at Wet Paint are all hands-on 2 hour workshops. Materials are included and you will have a finished project at the end of the class. There are workshop fees and registration is required. You can sign up online, by phone or in person. If classes don’t meet a minimum enrollment 3 days before the session begins, the class will be cancelled and your class fee will be refunded. If you sign up for one of these 4 classes over this weekend, you will receive a coupon to be used on a future purchase at Wet Paint. Click here to go to our Events page. Over the past few years we have helped bring Sumi-e artist and teacher Yuming Zhu to the Twin Cities. His following is so great we need to partner with other members of our creative community who have more space. 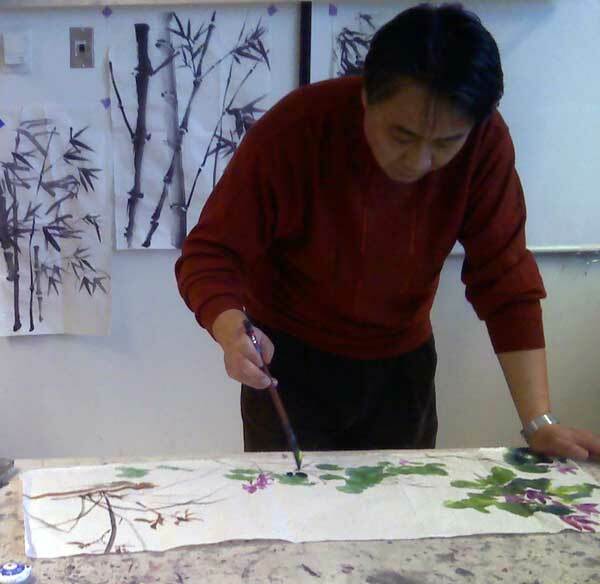 This April, Yuming is not only teaching a 2 day Sumi-e Painting workshop at Bloomington Theatre and Art Center (BTAC), he will also lecture to accompany an exhibit of his artwork at the Eagan Community Center. Plus Yuming is offering a unique class on Mounting Techniques for Sumi-e Art on Monday, April 14th, at BTAC. Many artists who have studied with Yuming have asked for training on this specific sumi-e technique of traditional wet mounting. This is an intermediate to experienced class, focused on those with a sumi-e and/or framing background. This is a unique opportunity to get hands-on experience at a master’s side. The programs at BTAC and Eagan require registration through those respective venues. Categories: Events at Wet Paint, News | Tags: art supplies, Bloomington Theater and Art Center, Classes, Eagan Community Center, Ioana Stoian, Joyce Francis, Origami, Sumi-e, Wet Paint St. Paul, Yuming Zhu, Zentangle | Permalink.